In their second debate back in October, Donald Trump told Hillary Clinton that if he were president “you’d be in jail.” Presidents don’t have the power to unilaterally jail their political opponents — we’re not there just yet—but the hive of white supremacy and unreconstructed fascism known as Breitbart is nonetheless furious that he’s not going to try. Trump senior adviser and chief apologist for every insane thing he does Kellyanne Conway appeared this morning on MSNBC. She told Trump friends Joe Scarborough and Mika Brzezinski that the president-elect is a very nice man who “does not wish to pursue charges” against Clinton. “I think when the President-elect, who’s also the head of your party, tells you before he’s even inaugurated that he doesn’t wish to pursue these charges, it sends a very strong message, tone, and content to the members,” Conway told these two awful people, smiling serenely. 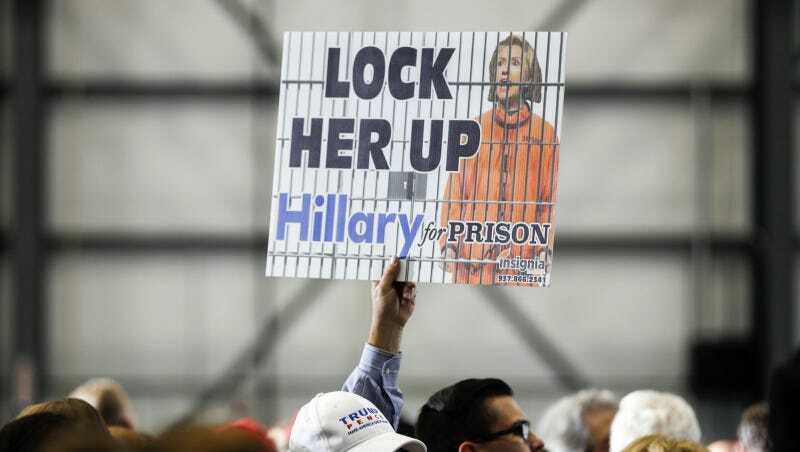 Surely Donald Trump’s only goal is helping Clinton “heal” from winning the popular vote and from repeated statements from the FBI that they found nothing criminal in her ill-advised private email server. As the Washington Post points out, Trump never had the authority to directly prosecute Clinton, and, theoretically, we still have firewalls between the White House and the Justice Department to keep a grimy orange maniac from pursuing his political vendettas. Nonetheless, Breitbart is heartbroken, putting this headline atop an otherwise straightforward story about Conway’s MSNBC appearance. It’s unclear what Breitbart chair Steve Bannon thinks of all this from his new seat as Trump’s chief strategist. He previously spoke admiringly of Trump as a “master of the head fake” and said Trump had harnessed the public’s “huge amount of anger” against Clinton. Just remember this: Trump will fail to make America great again in the specific way that white nationalists, vicious misogynists and anti-Semites had in mind. And when he does, most of them won’t blame him, and they’ll direct their anger back at the people they’ve been encouraged to demonize by their president-elect and his band of terrible friends.